Al Jazeera newsroom under construction. Al Jazeera (Arabic: الجزيرة /æl dʒæziːraː/, meaning "The Island") is a television network headquartered in Doha, Qatar. Al Jazeera initially launched as an Arabic news and current affairs satellite television channel of the same name, but has since expanded into a network of several specialty channels. The original Al Jazeera channel's willingness to broadcast dissenting views, including on call-in shows, created controversies in autocratic Arab states. The station gained worldwide attention following the September 11, 2001 attacks on the United States, when it broadcast video statements by Osama bin Laden and other al-Qaeda leaders. In April 1996, the BBC World Service Saudi-based Arabic language TV station, faced with censorship demands by the Saudi Arabian government, shut down after two years of operation. Many former BBC World Service staff members joined Al Jazeera, which at the time was not yet on the air. The channel began broadcasting in late 1996. Al Jazeera's availability (via satellite) throughout the Middle East changed the television landscape of the region. Prior to the arrival of Al Jazeera, many Middle Eastern citizens were unable to watch TV channels other than state-censored national TV stations. Al Jazeera introduced a level of freedom of speech on television that was previously unheard of in many of these countries. Al Jazeera presented controversial views regarding the governments of many Persian Gulf states, including Saudi Arabia, Kuwait, Bahrain, and Qatar; it also presented controversial views about Syria's relationship with Lebanon, and the Egyptian judiciary. Critics accused Al Jazeera of sensationalism in order to increase its audience share. Al Jazeera's broadcasts have sometimes resulted in drastic action: for example, on January 27 1999, Al Jazeera had critics of the Algerian government on during their live program The Opposite Direction. The Algerian government cut the electricity supply to large parts of the capital Algiers (and allegedly to large parts of the country), to prevent the program from being seen. The original Al Jazeera channel claimed to be the only politically independent television station in the Middle East. Its well-presented documentary on the Lebanese Civil War in 2000–2001 gave its viewer ratings a boost. However, it was not until late 2001 that Al Jazeera achieved worldwide popularity when it broadcast video statements by al-Qaeda leaders. In 2003, it hired its first English-language journalist, Afshin Rattansi, from the BBC's Today Programme which was at the heart of UK events when it came to Tony Blair's decision to back the U.S. invasion of Iraq. In response to Al Jazeera, a group of Saudi investors created Al Arabiya in the first quarter of 2003. Al Jazeera operates a number of specialty channels besides its original flagship news channel. As of early 2007, the Al Jazeera network's TV channels include Al Jazeera, the original international Arabic language 24 hour news and current affairs channel, launched in 1996; Al Jazeera Sports, launched in 2003; Al Jazeera Mobasher (aka Al Jazeera Live), a live politics and public interest channel (similar to C-SPAN or BBC Parliament), which broadcasts conferences in real time without editing or commentary, launched in 2005; Al Jazeera Children's Channel (aka JCC), a children's interest channel, launched in 2005; Al Jazeera English, a global English-language 24 hour news and current affairs channel, launched in 2006; and Al Jazeera Documentary Channel, an Arabic language documentary channel, launched in 2007. It is widely believed internationally that inhabitants of the Arab world are given limited information by their governments and media, and that what is conveyed is biased towards the governments' views which highlights the tension between objectivity and audience appeal, to describe the station's controversial yet popular news approach. As a result, it is probably the most watched news channel in the Middle East. Despite a widespread US belief that Al Jazeera provokes strong feelings of anti-Americanism among its audience, its effects on Arab audiences have been found to differ little from the influence of CNN or BBC. Increasingly, Al Jazeera's exclusive interviews and other footage are being rebroadcast in American, British, and other western media outlets such as CNN and the BBC. In January 2003, the BBC announced that it had signed an agreement with Al Jazeera for sharing facilities and information, including news footage. Al Jazeera is now considered a fairly mainstream media network, though more controversial than most. In the United States, video footage from the network is largely limited to showing video segments of hostages. As of 2007, the Arabic Al Jazeera channel rivals the BBC in worldwide audiences with an estimated 40 to 50 million viewers. Al Jazeera English has an estimated reach of around 80 million households. The original Al Jazeera channel is available worldwide through various satellite and cable systems. In the U.S., it is available through subscription satellite TV. Al Jazeera can be freely viewed with a DVB-S receiver in Europe, Northern Africa, and the Middle East as it is broadcast on the Astra and Hot Bird satellites. Al Jazeera maintains a large presence on the web. It serves the same role in the Middle East that CNN serves in America and the BBC serves in the UK of being one of the main news outlets. Al Jazeera features news, entertainment information, features, business, and sports. Al Jazeera makes this information available in English as well as Arabic. The online news network, like the television network, covers events across the world. On March 4, 2003, during the run-up to the invasion of Iraq, the New York Stock Exchange banned Al Jazeera (as well as several other news organizations whose identities were not revealed) from its trading floor indefinitely, citing "security concerns" as the official reason. The move was quickly mirrored by Nasdaq stock market officials. During the Iraq war, Al Jazeera faced the same reporting and movement restrictions as other news-gathering organizations. In addition, one of its reporters, Tayseer Allouni, was banned from the country by the Iraqi Information Ministry, while another one, Diyar Al-Omari, was banned from reporting in Iraq (both decisions were later retracted). On April 3, 2003, Al Jazeera withdrew its journalists from the country, citing unreasonable interference from Iraqi officials. In May 2003, the CIA, through the Iraqi National Congress, released documents purportedly showing that Al Jazeera had been infiltrated by Iraqi spies, and was regarded by Iraqi officials as part of their propaganda effort. As reported by the Sunday Times, the alleged spies were described by an Al Jazeera executive as having minor roles with no input on editorial decisions. On September 23, 2003, Iraq suspended Al Jazeera (and Al-Arabiya) from reporting on official government activities for two weeks for what the Council stated as supporting recent attacks on council members and Coalition occupational forces. The move came after allegations by Iraqis who stated that the channel had incited anti-occupation violence (by airing statements from Iraqi resistance leaders), increasing ethnic and sectarian tensions, and being supportive of the resistance. During 2004, Al Jazeera broadcast several video tapes of various kidnapping victims which had been sent to the network. The videos were filmed by the groups after kidnapping a hostage. The hostages are shown, often blindfolded, pleading for their release. They often appear to be forced to read out the prepared statements of their kidnappers. Al Jazeera has assisted authorities from the home countries of the victims in an attempt to secure the release of kidnapping victims. This included broadcasting pleas from family members and government officials. Contrary to some allegations, Al Jazeera has never shown beheadings which often appear on internet websites. On August 7, 2004, the Iraqi Allawi government shut down the Iraq office of Al Jazeera, claiming that it was responsible for presenting a negative image of Iraq, and charging the network with fueling anti-Coalition hostilities. Al Jazeera vowed to continue its reporting from inside Iraq. News photographs showed United States and Iraqi military personnel working together to close the office. Initially closed by a one-month ban, the shutdown was extended in September 2004, and the offices sealed. On July 4, 2005, Al Jazeera officially announced plans to launch a new English-language satellite service to be called Al Jazeera International. The new channel started on November 15, 2006, under the name Al Jazeera English with broadcast centers in Doha (next to the original Al Jazeera headquarters and broadcast center), London, Kuala Lumpur, and Washington D.C.. The channel is a 24-hour, 7-day-a-week news channel with 12 hours broadcast from Doha and four hours each from London, Kuala Lumpur, and Washington D.C.
With Al Jazeera's growing global outreach and influence, some scholars including Adel Iskandar have described the station as a transformation of the very definition of "alternative media." Al Jazeera English is a 24-hour English-language news and current affairs television channel headquartered in Doha, Qatar. It is the sister channel of Al Jazeera Arabic TV. The channel was launched on November 15, 2006. Al Jazeera English is the world’s first English-language news channel headquartered in the Middle East. The channel aims to provide both a regional voice and a global perspective to a potential world audience of over one billion English speakers, but without an Anglo-American worldview. Instead of being run under central command, news management rotates around broadcasting centers in Kuala Lumpur, Doha, London, and Washington, D.C., "following the sun." The station broadcasts factual programming including news features and analysis, documentaries, live debates, current affairs, business, and sports. The station claims to be the first global high-definition television network. Al Jazeera English has stated objectives of emphasizing news from the developing world, of, "reversing the [North to South] flow of information," and of, "setting the news agenda." The latter is the channel's main slogan. Some observers have commented that this focus can be seen, in the eyes of Western viewers, as casting Al Jazeera English as a global "alternative" news network, though the entire Al Jazeera brand has been heavily mainstreamed in many parts of the world. Other Al Jazeera English slogans and catchphrases include: "Every angle, every side," "all the news, all the time," "fearless journalism" and, "if it's newsworthy, it gets on air, whether it's Bush or Bin Laden." An incorrect, but widely reported, criticism is that Al Jazeera has shown videos of masked terrorists beheading western hostages. When this is reported in reputable media, Al Jazeera presses for retractions to be made. This allegation was again repeated by Fox News in the United States on the launch day of Al Jazeera's English service, November 15, 2006. While Al Jazeera boasts of adhering to a tight code of ethics, they have still been criticized for what would definitely be lapses in these ethics. Criticisms have involved allegations of bias, selective coverage, supporting terrorism, and propaganda. All of which would be violations of their code of ethics, which advocates honesty, validity, respect, fairness, and diversity. Bahrain Information Minister Nabeel Yacoob Al Hamer banned Al Jazeera correspondents from reporting from inside the country on May, 10, 2002, saying that the station was biased towards Israel and against Bahrain. After improvements in relations between Bahrain and Qatar in 2004, Al Jazeera correspondents returned to Bahrain. Al Jazeera has been criticized for failing to report on many hard hitting news stories that originate from Qatar, where Al Jazeera is based. The two most frequently criticized stories were the revoking of citizenship from the Al Ghafran clan of the Al Murrah tribe in response to a failed coup that members of the Al Ghafran clan were implicated in, and Qatar's growing relations with and diplomatic visits to Israel. Reporter Taysir Allouni was arrested in Spain on September, 5, 2003, on a charge of having provided support for members of al-Qaeda. Judge Baltasar Garzón, who had issued the arrest warrant, ordered Allouni held indefinitely without bail. He was nevertheless released several weeks later because of health concerns, but was prohibited from leaving the country. On September 19, a Spanish court issued an arrest warrant for Allouni, before the expected verdict. Allouni asked the court for permission to visit his family in Syria to attend the funeral of his mother, but authorities denied his request and ordered him back to jail. Although he pleaded not guilty of all the charges against him, Allouni was sentenced on September 26, 2005 to seven years in prison for being a financial courier for al-Qaeda. Allouni insisted he merely interviewed bin Laden after the September 11th attack on the United States. Many international and private organizations condemned the arrest and called on the Spanish court to free Taysir Allouni. Websites such as Free Taysir Allouni and Alony Solidarity were created to support Allouni. In 1999, New York Times reporter Thomas L. Friedman called Al-Jazeera "the freest, most widely watched TV network in the Arab world." The station first gained widespread attention in the west following the September 11, 2001 attacks, when it broadcast videos in which Osama bin Laden and Sulaiman Abu Ghaith defended and justified the attacks. This led to criticism by the United States government that Al Jazeera was engaging in propaganda on behalf of terrorists. Al Jazeera countered that it was merely making information available without comment, and indeed several western television channels later followed suit in broadcasting portions of the tapes. While prior to September 11th, 2001, the United States government lauded Al Jazeera for its role as an independent media outlet in the Middle East, US spokespersons have since claimed an "anti-American bias" to Al Jazeera's news coverage. In 2004 the competing Arabic-language satellite TV station Al Hurra was launched, funded by the U.S. government. On January 30, 2005, the New York Times reported that the Qatari government, under pressure from the Bush administration, was speeding up plans to sell the station. In April 2004, Webby Awards nominated Al Jazeera as one of the five best news Web sites, along with BBC News, National Geographic, RocketNews, and The Smoking Gun. In December 1999, Ibn Rushd (Averoes) Fund for Freedom of Thought in Berlin awarded the "Ibn Rushd Award" for media and journalism for the year to Al Jazeera. ↑ Al Jadid. Al Jazeera Remains in the Hot Seat Retrieved February 25, 2007. ↑ Pravda.Al Jazeera vs. CNN Retrieved February 25, 2007. ↑ Google Video. Books of our Time: Al-Jazeera Retrieved February 25, 2007. ↑ TBS Journal. The Minotaur of 'Contextual Objectivity': War coverage and the pursuit of accuracy with appeal. Retrieved February 25, 2007. ↑ American Communication Journal. The Arabic Aljazeera Vs Britain’s BBC and America’s CNN: who does journalism right? Retrieved February 25, 2007. ↑ Allied Media Corp. Who Watches Al Jazeera? Retrieved February 25, 2007. ↑ Guardian Unlimited. 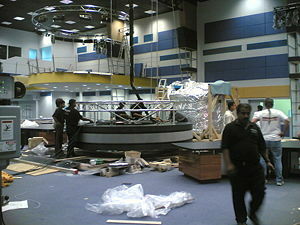 BBC World dropped by Israeli satellite TV Retrieved February 25, 2007. ↑ Allied Media Corp. Al Jazeera TV Footprint - Coverage Retrieved February 25, 2007. ↑ Al Jazeera. Rumsfeld blames Aljazeera over Iraq Retrieved February 25, 2007. ↑ TBS Journal. Is Al Jazeera Alternative? Mainstreaming Alterity and Assimilating Discourses of Dissent Retrieved February 25, 2007. ↑ Al Jazeera sets English launch date Retrieved March 25, 2007. ↑ Al Jazeera's (Global) Mission Retrieved March 25, 2007. ↑ Iskandar, Adel. Is Al Jazeera Alternative? Mainstreaming Alterity and Assimilating Discourses of Dissent Retrieved March 25, 2007. ↑ Al Jazeera. Code of Ethics Retrieved March 18, 2007. ↑ BBC News. Bahrain bans Al Jazeera TV Retrieved February 25, 2007. ↑ Thomas L. Friedman, "Fathers and Sons," New York Times, February 12, 1999, A27. ↑ The New York Times. THE IRAQI ELECTION: THE NETWORK; Under Pressure, Qatar May Sell Jazeera Station Retrieved February 25, 2007. ↑ The Webby Awards April 23, 2004. Retrieved March 25, 2007. ↑ BrandChannel. 2004 Readers' Choice Awards Retrieved February 25, 2007. ↑ Index for Free Expression. Free speaking voices in the wilderness Retrieved February 25, 2007. ↑ Ibn Rushd. IBN RUSHD Fund for Freedom of Thought presents the IBN RUSHD Award for media and journalism for the year 1999 to Al-Jazeera TV Stellite Channell on the 10th of December 1999 in Haus der Kulturen der Welt - Berlin Retrieved February 25, 2007. Lynch, Marc. 2005. Voices of the New Arab Public: Iraq, al-Jazeera, and Middle East Politics Today. Columbia University Press. Ratta, Donatella Della. 2005. Al Jazeera. Media e società arabe nel nuovo millennio. Bruno Mondadori. This page was last modified on 23 February 2016, at 21:00.